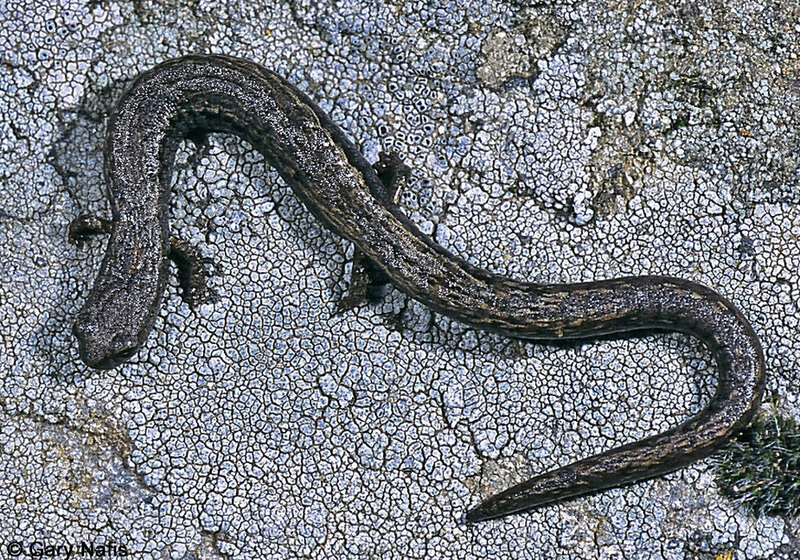 A comparison of an adult salamander (adult 2) that is probably Batrachoseps minor shown on the left with a small specimen of the sympatric Black-bellied Slender Salamander, Batrachoseps nigriventris, which was found well outside of the range of B. minor. (B. nigriventris adults grow larger than this specimen.) You can see that B. minor has distinctly larger hands and feet. Adult 1, shown in the top row, was the first live specimen of B. minor found in more than ten years. It was discovered by Tim Burkhardt, a major contributor to this website, with Samantha Winegarner in February of 2001. Chemical analysis by the University of California at Berkeley confirmed the species. More information here. Adult 2 was found in February 2003 in the same location where adult 1 was found. It is not possible to positively differentiate B. minor from B. nigriventris by sight, only chemical analysis is definitive. Adult 2 was tentatively identified by its body and limb size and this was confirmed through photographs by David Wake, but it was not identified through chemical analysis, so there is still a slight possibility that Adult 2 is not B. minor but an abnormal B. nigriventris. Adults are 1 - 2 3/10 inches long (2.5 - 5.8 cm) from snout to vent. 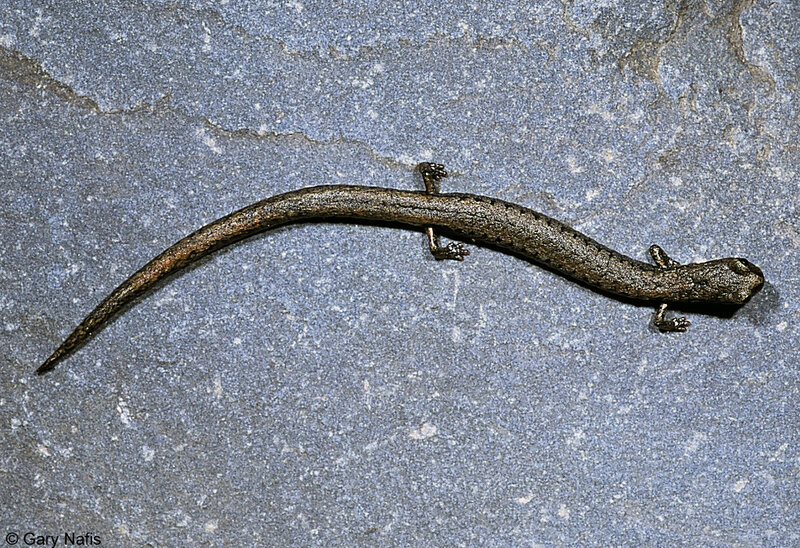 A small, slim salamander, the smallest of the Slender Salamanders, with 17-18 costal grooves, a short body, fairly long legs, and a broad head with a distinct neck. 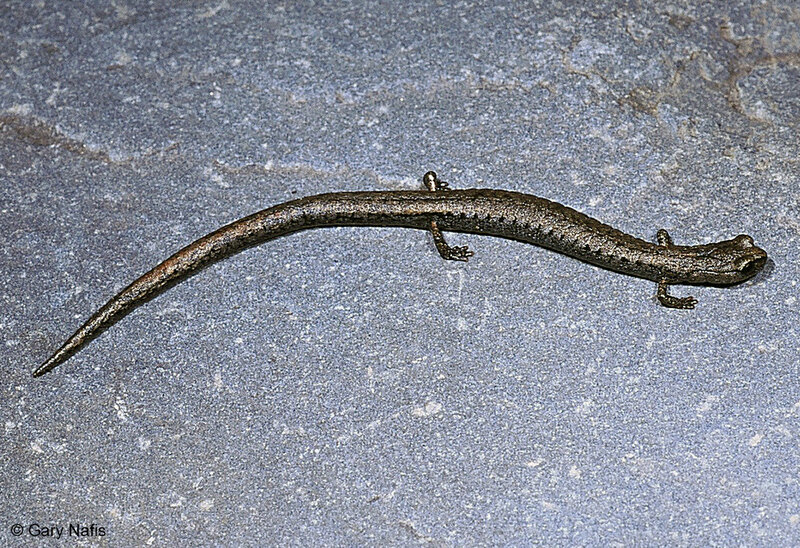 Small size, short limbs, a long slender body with a narrow head and a long tail, and conspicuous costal and caudal grooves give this species the worm-like appearance typical of most Slender Salamanders. There are 9-12 costal folds between adpressed limbs. Color is blackish brown, sometimes with a tan dorsal stripe with pinkish or apricot highlights, most noticable on the tail. Coexists with B. nigriventris. B. minor is distinguished by its more robust body, broader head and longer and larger limbs with more conspicuous toes than B. nigriventris. Most likely eats a variety of small invertebrates. 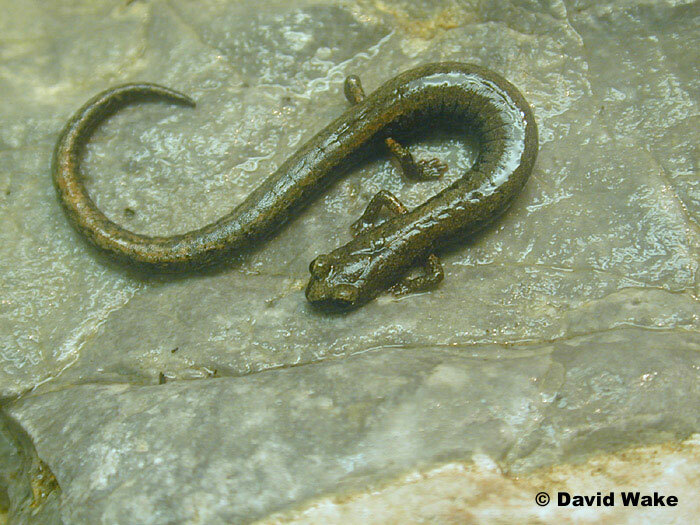 Other female Slender Salamanders lay eggs in moist places underground. Inhabits moist locations in forests of mixed oak, tanbark oak, sycamore and laurel above 1,300 ft. (400 m). Endemic to California. 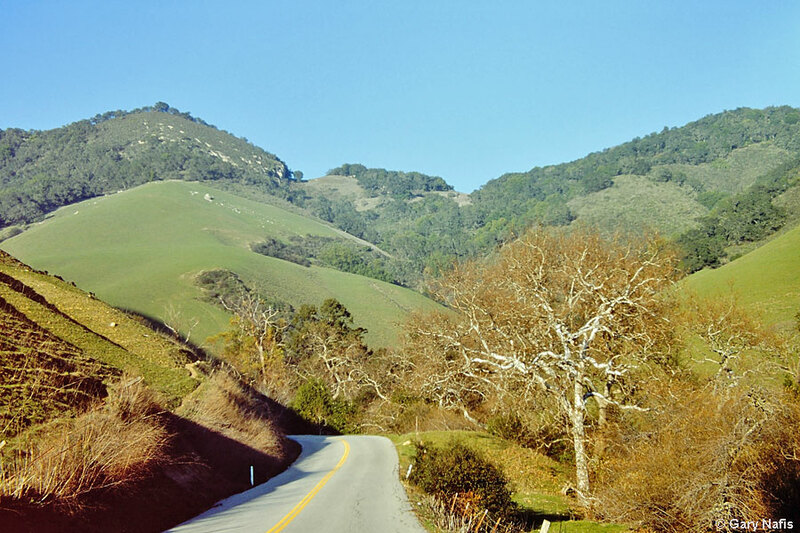 Found only in a small area in the southern Santa Lucia Mountains of San Luis Obispo county. Prior to its description in 2001, B. minor was recognized as B. pacificus which has been split into ten species as the result of molecular studies. "B. minor is now genuinely rare. 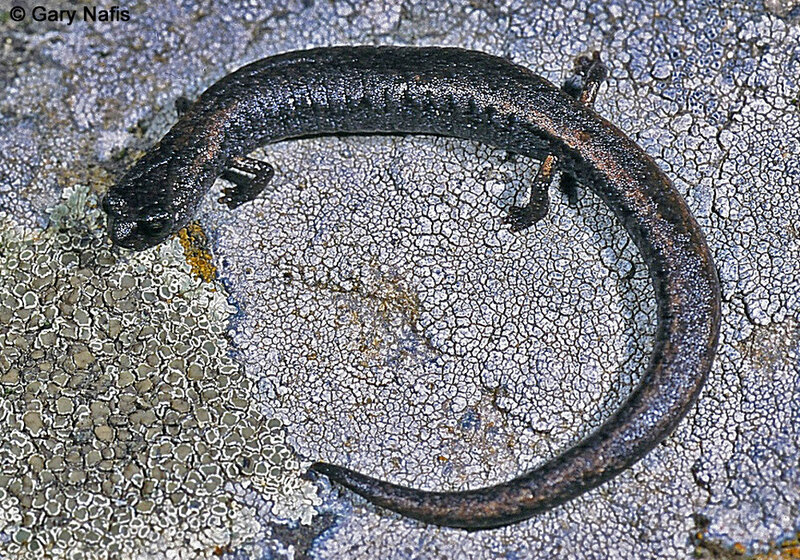 We (Arden Brame and I) once found 25 salamanders in an area near York Mountain Winery. They could be sorted into two piles of 10 and 15. The B. minor were small but robust, with distinctly larger hands and feet in individuals of the same length, and these also had a somewhat broader head and a "neck", altough the latterfeature is subtle. When examined osteologically the two also differed in one important character, presence or absence of a tibial spur. This is what convinced me that there were two species. It took many years to finally get the genetic information that demonstrated that the two rather similar species are distinct and not even close relatives." David B. Wake, public internet forum correspondence. Previously more common, B. minor is now difficult to find, and is greatly outnumbered by B. nigriventris with which it co-exists. Similarities in appearance with B. nigriventris make it difficult to survey for and estimate current numbers of this species. California with descriptions of four new species.'' Herpetological Monographs, #15 2001. Elizabeth L. Jockusch, Kay P. Yanev, and David B. Wake ''Molecular phylogenetic analysis of slender salamanders, genus Batrachoseps (Amphibia: Plethodontidae), from central coastal California with descriptions of four new species.'' Herpetological Monographs, #15 2001. NatureServe Global Ranking G1 Critically Imperiled—At very high risk of extinction due to extreme rarity (often 5 or fewer populations), very steep declines, or other factors. Imperiled—At high risk of extinction due to very restricted range, very few populations (often 20 or fewer), steep declines, or other factors. Critically imperiled in the state because of extreme rarity (often 5 or fewer populations) orbecause of factor(s) such as very steep declines making it especially vulnerable to extirpation from the state.